This lovely private holiday home complex has been newly built for 2007. Consisting of 14 two storey townhouses/apartments overlooking two luxurious swimming pools plus a children's pool which are for the exclusive and private use of the residents. 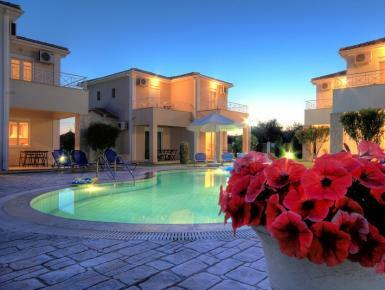 The complex is located in a most desirable area on the edge of the resort of Kalamaki. Just a 5 minute stroll will bring you to the famous and ever popular Michael's Taverna and a further 5 minutes will take you right into the heart of the resort with all it's facilities. A 15 minute walk from the complex is the crystal clear blue waters and white sands of Kalamaki's Crystal Beach, one of the favourite nesting beaches of the famous Loggerhead Turtle.